Whether you make this for St. Patrick's day or for a hearty meal when the weather is cold, make sure you make more than you need. It gets better the second day and freezes beautifully. Nothing makes me happier than being able to pull a package of homemade food out of the freezer for a quick weeknight meal. This recipe originated from Fidel Murphy's Irish Pub in the Grand Cayman islands and was published in the March 2001 issue of Bon Appétit. You will find various versions all over the web. Interestingly, the original recipe does not include Guinness or wine, which in my mind are the keys to the fabulous flavor of the broth. This is my take on the recipe. As usual for me, I have increased the quantities and made several modifications. While a little thinner than some stew broth, the flavor is very concentrated and savory. I originally published this recipe as gluten-free, but have since removed the gluten-free status. I purposefully avoided flour to try and make this stew gluten-free. Guinness Stout is wheat-free, but it does contain malted barley, which does contain gluten. If you are trying to adhere to a gluten-free diet, you can make this stew without the stout. Substitute wine or broth for the stout. Make a day or two ahead and let the flavors meld in the fridge. To save time don't prepare the vegetables until after the meat is stewing. While the meat is stewing in the broth, chop and saute the vegetables. This way they will be ready to add to the stewed meat after the meat has simmered for an hour. Simmer on a fairly high heat - closer to medium than low. This is needed to reduce the broth. 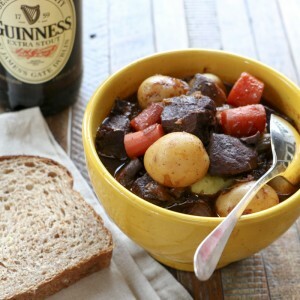 Irish beef stew's two secret ingredients are stout and red wine. Loaded with vegetables, this make-ahead stew is comforting when the weather is cool and a great meal to celebrate your inner Irish on St. Patrick's Day. Liberally season the beef with salt and pepper. Heat a large, heavy-bottomed pot on a medium-high burner and add the oil. When the oil begins to shimmer add half the beef and saute until brown on all sides, about 5 minutes. Remove the browned beef to a plate and continue browning the remaining beef. When all the beef is browned, combine all the beef in the pot and add garlic. Saute another minute or two. Add chicken broth, beef broth, red wine, stout, tomato paste, Worcestershire sauce, sugar, thyme and bay leaves. Bring to a boil, reduce heat to medium-low and cover. Simmer for one hour. While beef is simmering, prep the vegetables. In a large skillet melt the butter and saute the onions, carrots and celery over medium-high heat for about 5 minutes. Add potatoes and mushrooms and season liberally with salt and pepper. Continue to saute until vegetables begin to brown, another 10 - 12 minutes. Add the vegetables to the meat and broth. Simmer until meat and vegetables are tender, about 40-45 minutes. Remove thyme sprigs and bay leaves. Put in individual serving bowls and sprinkle with chopped parsley.